Day 5: Repurpose Week - Jill Ruth & Co.
Love the door knobs--- even without the door. This one hold a collection (just a few) of my aprons. I wish I could claim this, but we bought this door remade into a shelf unit at an antique store. The lighting was tough for a picture and doesn't show the beautiful patina very well. Something needs to hang from this knob! I made two lamps a few years back out of old spools. I bought a lamp kit--really not too hard. I collaged over the plain purchased shade. I do love vintage pattern, images, and words. The ads are especially fun to read through! This is a wire bale that was on an old jar--used to snap the glass lid down. I got a few of these in a box once at an auction. 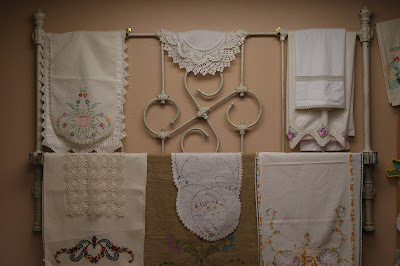 Now, they serve as hangers for a collection of tea towels I have. I wrapped muslin around each wire under the towel so I wouldn't get rust on the towels. Tomorrow, I'm asking for help and ideas for a few things I have but just can't come up with what to do with them. Oh my goodness! I love it all! It is so much fun to come up with projects like this. I'm sure the clerks at the thrift stores think I am crazy sometimes because of the things I buy. I will tell them, "I have no idea what this is, but I will use it for something." Lots of cool things! That is a great cast iron headboard! It looks pretty with your linens on it. Summer Kitchen Interiors was asking me if I had any for a customer of theirs that was looking for a cast iron bed. You don't see a lot of them and they can be pretty pricey. So I'll bet someone would love to have your foot board!